A1C Griffin Smith and William Manion, both 33rd Maintenance Squadron aircraft fuels system repairman apprentices, don safety gear to prepare an F-35A Lightning II for maintenance at Eglin Air Force Base, Fla., Jan. 13, 2016. Fuel systems Airmen work on top of the jets to remove, repair, inspect, install and modify aircraft fuel systems. Since the introduction of the F-35A Lightning II, airmen at the 33rd Fighter Wing at Eglin Air Force Base, Fla., have saved the Air Force close to $84,000 and more than 720 hours of shipping delays by locally manufacturing parts and tools. 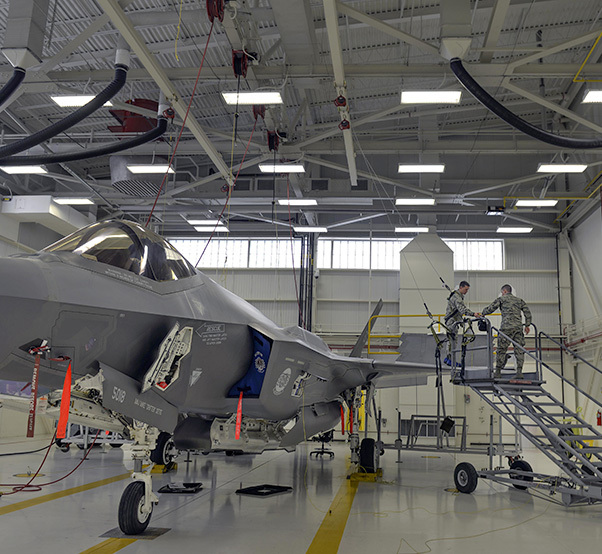 Around 500 maintenance personnel are assigned to work with the F-35 at Eglin Air Force Base. These airmen and sailors are some of the first to maintain the fifth-generation jet which gives them the opportunity to assist manufacturers in developing tools, technology and data to maintain it. Aircraft metals technology specialists at the 33rd Maintenance Squadron fabricate tools and equipment in-house to streamline and refine existing F-35 maintenance practices. Metals airmen play a direct role in the progression of the program by engineering items to safeguard and secure equipment. Two of the tools 33rd FW metals technology specialists developed are the grommet swaging tool and the push tester adapter. The grommet swaging tool keeps grommets in place during installation of aircraft panels, while push tester adapters secure nut plates during tests to prevent objects from falling inside the aircraft. These tools have saved the wing more than $17,000 in orders and repairs. Technicians also designed and fabricated sets of stiffeners, throttle quadrant covers and a bullet-style axle thread protector, which keep parts in the jet protected during post-flight inspections and maintenance. In total, these parts saved the Air Force nearly $67,000 in manufacturer repairs as they are used throughout the F-35 enterprise. TSgt. Travis Yeager, the 33rd MXS NCO in charge of aircraft metals technology, said more innovations are on the horizon for his squadron. The responsibilities of maintenance airmen go beyond creating tools and parts. They also develop the technical data and action reports used by F-35 units across the program. This process involves reporting discrepancies found during maintenance. After reporting, maintainers troubleshoot with a technical data checklist — a manual that lays out different steps for correcting an error. Sometimes, an issue requires consultation with the manufacturer to determine a way forward. Each new solution is formalized as a future troubleshoot check list. TSgt. Martin Miller, a 33rd MXS fuel system craftsman, said he finds a lot of job satisfaction as part of the team that will influence the care of the fifth-generation jet throughout the lifetime of the program. For fuels airmen at the 33rd FW, it doesn’t get any better than being at the forefront of information distribution with the newest fighter program. SrA. Scott Richards, a 33rd MXS fuel systems journeyman, is confident the wing’s efforts and innovations will continue to shape the maintenance of the aircraft.